2017 has been another great year for us here at CCPI Europe. We’ve continued to grow throughout the year, allowing the investment in new state of the art equipment as well as expand our team to keep up with demand. Here’s a run-down of the major points of interest from 2017. Throughout 2017, a joint effort from CCPI Europe, TE Wire & Cable and the University of Cambridge / Cambridge Enterprise program saw the stunning results of the low drift duel wall mineral insulated thermocouple. The low drift thermocouples underwent rigorous testing in the CCPI thermal calibration laboratory and the results below everyone’s minds! 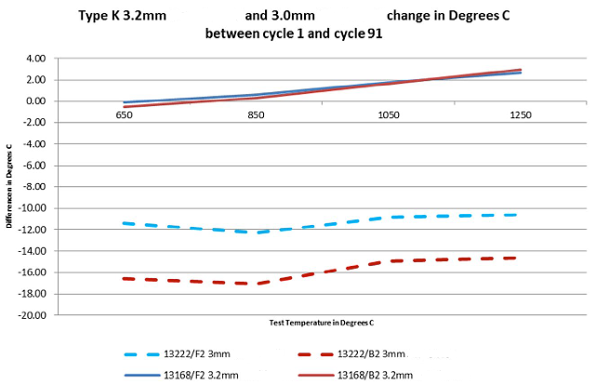 The new low drift cables had over 80% drift reduction at 1200℃ and over 90% at 1300℃. In May 2017 Rob Godley joined our team as the Marketing and Communication Associate. Since starting Rob has begun working on the website, making it more user friendly and accessible , updated the marketing material and even got an article featured in The Sheffield Star's - Made in Sheffield Edition. The future of the Marketing department is looking very positive with many projects coming up in the new year. In June 2017, Encarna Martin joined our European team representing Spain and Portugal, with the aim to improve the organisation’s market position and achieve financial growth in Europe, mainly focused to Composite Material parts manufacturing. With her master’s degree in aerospace engineering, Encarna is proving to be an important member of the CCPI Europe sales team. In July, we launched our very own FREE thermocouple data analysis app – Pyro Tag! The app was developed to remove the mountains of paperwork and the possibilities of human error during the data entry process, as well as making audits swift and simple. The app gives instant access to serial numbers, calibration & quality data, product re-orders & quotes as well as certificates and it can all be sent to your work email! It’s available now on the Google Play Store for Android and The App Store for Apple. Also in July, we celebrated our 2nd anniversary of joining Marmon engineered wire & cable, a Berkshire Hathaway company. Strategic to the acquisition was the future partnership with another Marmon company; TE Wire & Cable based in Saddle Brook (NJ). Since 2015 the European Team at CCPI Europe have received extensive product training on TE Wire & Cable superior range of Calibrated Thermocouple Cables, Extension Cables and Compensating Cables including the highly successful AccuClave series of Calibrated Thermocouple Sensor Assemblies for use in Aerospace Composite Autoclave applications. Our new Wigan based service engineer, Philip Davies, joined our service department at the beginning of August 2017. His location is ideal for accessibility around the UK visiting customers for all their servicing and on-site calibration needs. With big changes coming to the services department, it’s an exciting time to be a member of the team! Stay tuned for more information regarding the upgrade of services. 2018 is looking very promising and successful for everyone here at CCPI Europe and we’re excited to see what the year will bring! From the entire team here, we hope you have a very Merry Christmas and a Happy New Year!